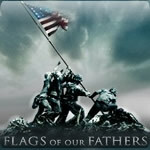 Looks like director Clint Eastwood's long-time collaborator, LENNIE NIEHAUS will be scoring the upcoming world war II film, FLAGS OF OUR FATHERS. Can't say this will get too many excited, but let's wait and hear what he comes up with. Given the subject matter, there's plenty of opportunity to do something memorable.